I collected Heather and Rachel and drove them to Loch Trool where Carl had already arrived. The others got there soon after: Richard, Andrea, Tasha and Fanny (French, from Normandy, a new arrival at Kirkcowan), Ken, Mary, Duncan, Irene, Peter Reed, Catherine, Anne, Leslie and Jim. Irene had the boot lid of her car come down on her head and took quite a long time trying to recover from it. After explaining that our walk was going to be a shorter one than on the programme owing to the height of the water and the flooding we had encountered last week, that part of the planned walk around the Loch would include more road walking owing to work still ongoing with the logging companies, about the possibility of encountering disinfectant provided on the route because of the recent worries about larch tree infection, introducing Fanny and telling them that Rachel would be my ‘back-up’ and THEN telling them that she would be leading and that I would be her ‘back-up’, we eventually set off on our walk!!! 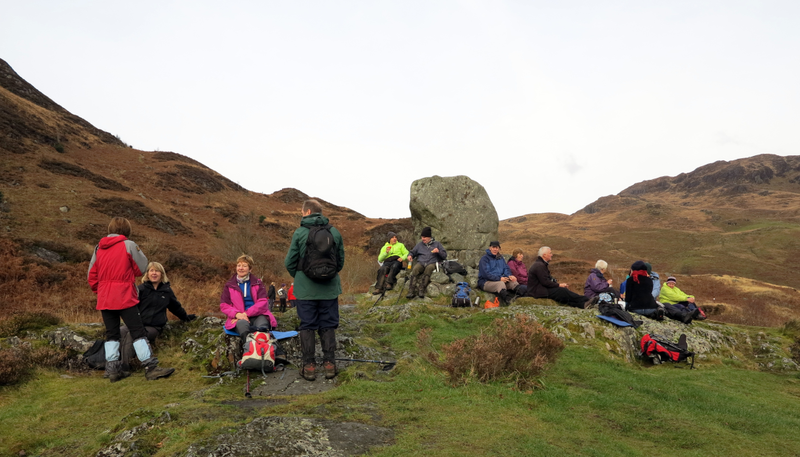 On Saturday, 17 ramblers, including two visitors, one from New Zealand and one from Normandy, met at Caldons car park, Glen Trool, for a circular walk around Loch Trool. This was shorter than originally intended. 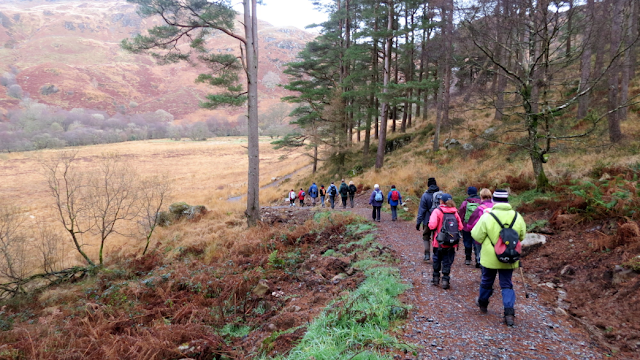 Part of the walk was abandoned due to flooding of the Water of Trool. Setting off through the old campsite the air was fresh and crisp, the trees and undergrowth coated with frost. A red squirrel was spotted in the branches overhead. When the new footpath along the south side of Loch Trool was reached, it was found to be a big improvement over the old one. In spite of the recent bad weather, the going was dry and clean, a welcome respite from the mud the group has become accustomed to. The walkers enjoyed the views along this part of the walk. 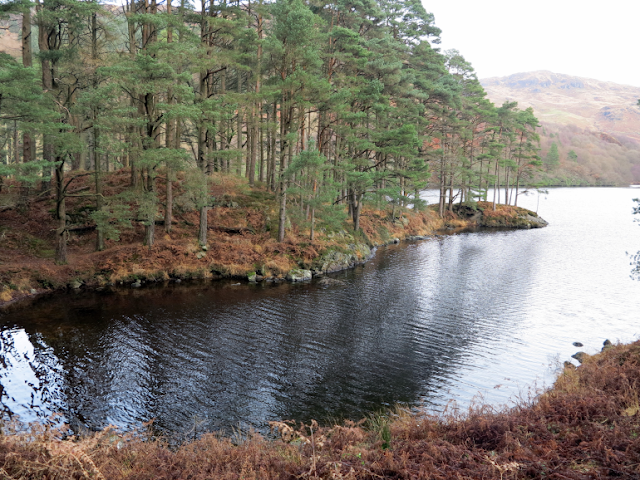 With very little wind, the still waters of Loch Trool reflected the trees perfectly. 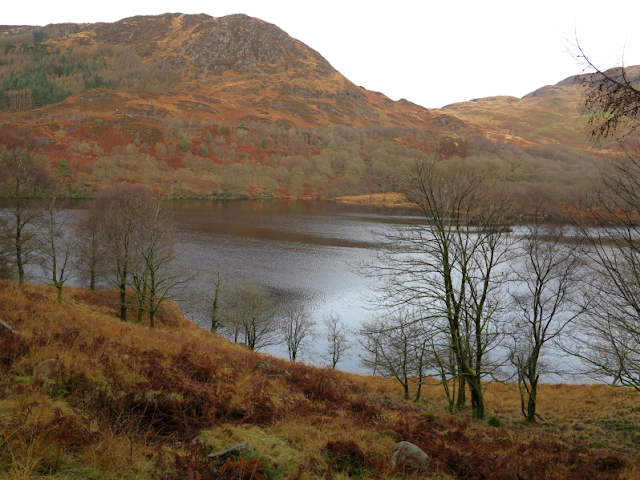 The Fell of Eschoncan, Benyellary and Buchan Hill were clothed in the burnt orange colours of dead bracken leaves and grasses. I was so lucky to be at the back as there were so many photos to take! The autumnal colours were lovely despite the day being somewhat overcast but there was no sign of rain as we went along what was now a more feet and hip friendly path, aided by the fallen leaves which covered the hard surface. Carl and I were constantly rushing to catch up, sometimes joined by Jim – he stayed with the group more often and got lots of great photos of them as well as of our surroundings. We had a sweetie stop at the eastern end of the loch where a view point had been created – at present it is in a clear area and probably this will continue as below it is a stretch of low land which might not be a great tree planting area. 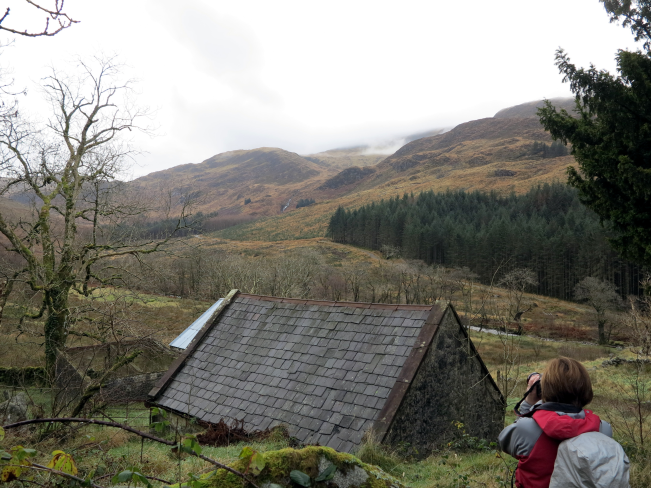 On reaching the end of Loch Trool a visit was paid to Glenhead farmhouse where walkers found the doors and windows blocked up with breeze blocks. This classic Galloway farmhouse is facing demolition if no other use can be found for it soon. Pausing to admire the Gairland burn in spate, and the waterfall at Buchan Bridge the group arrive at Bruce’s Stone for lunch. This monument was erected in 1929 to commemorate Robert the Bruce’s first victory over an English army in the Scottish wars of independence. 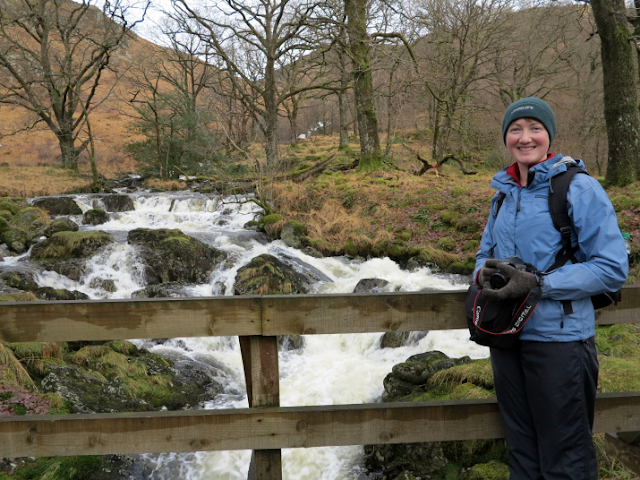 The forest road was followed all the way to Bruce’s Stone but we had a long stop at the bridge over Gairland Burn which was in full spate, unsurprisingly, and Carl and I stopped at what he now knows as one of my favourite places for a photo-shoot. 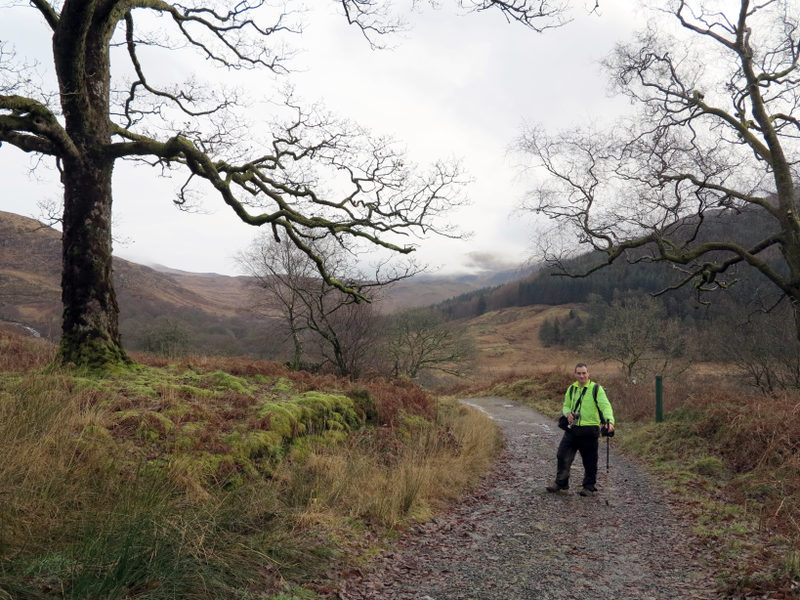 I told him I would have to ‘make-do’ with him as my perspective and foreground ‘interest’ and got a good photo of him between two trees with the wonderful hills in the background. Thank you Carl. 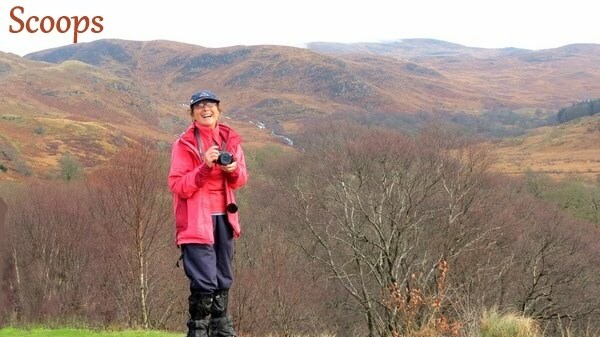 We did what I hate in others – stayed at Bruce’s Stone a long time eating, taking over the view which other photographers would now find ‘blighted’! However, we did not encounter any later visitors. The road walking back to the cars was lovely as it was mostly downhill and the views which surrounded us were mostly good. It is horrible seeing the destruction where the recent logging has left behind the remnants of branches and the chewed up ground. We had hoped that the new pathway would have been formed by now but that possibility seems distant. 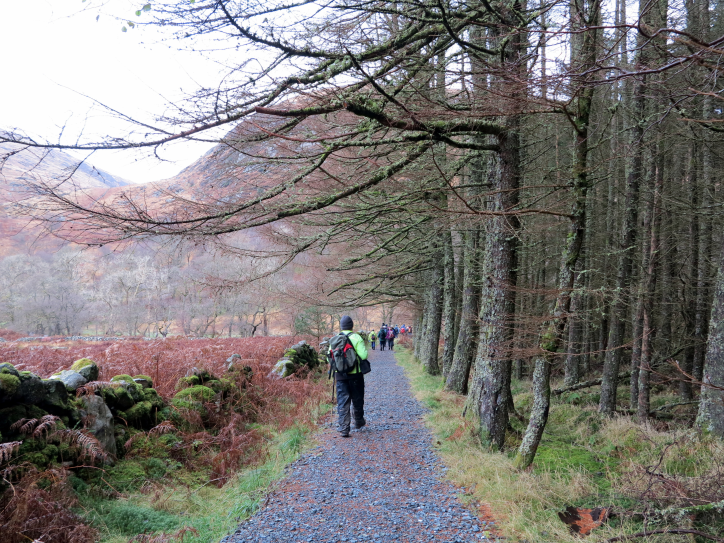 The path along the north side of Loch Trool was closed due to logging. Larch trees in this area have been infected by the fungus-like pathogen Phytophthora ramorum which can kill a tree in one growing season. 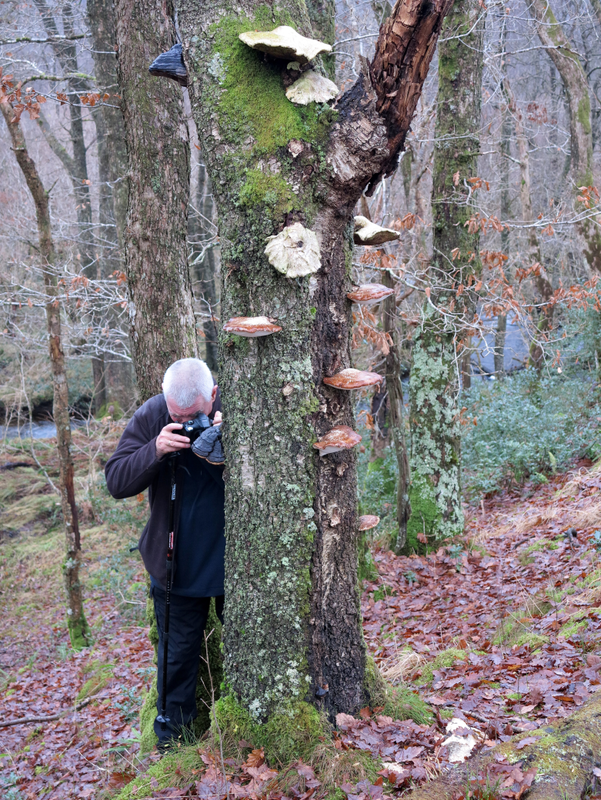 Once the disease has been detected felling is essential to control the outbreak and stop it spreading to our native trees. 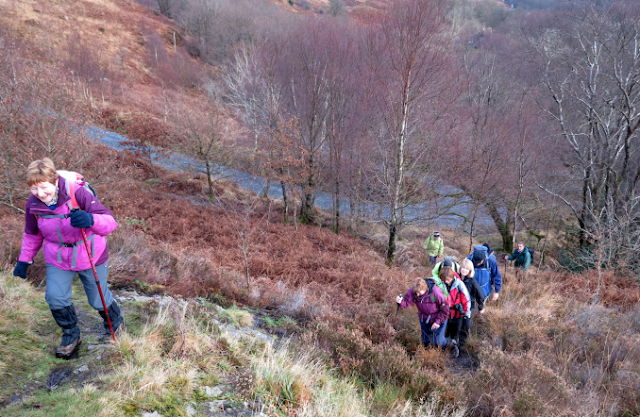 Walkers made their way down the road to reach Caldons car park, where rucksacks were stored in cars. A visit was then made to the nearby Martyrs Tomb which marks the place where six covenanters were killed while at prayer in 1685. 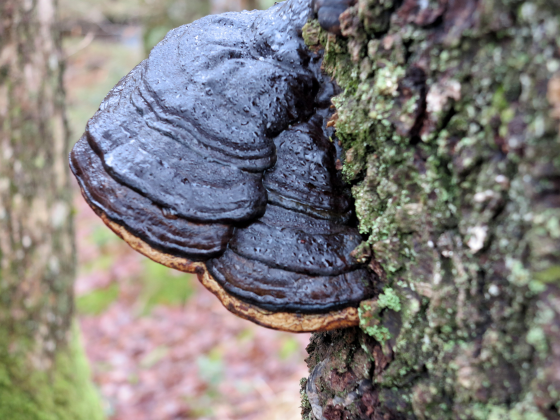 From here the group continued to the Water of Trool, pausing to admire bracket fungi on the trunk of a dead tree, before returning to their cars. 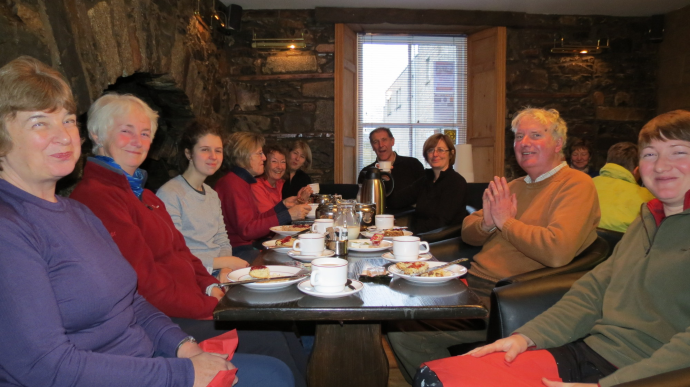 Tea, scones and a roaring fire were enjoyed at The Galloway Arms Hotel in Newton Stewart by most of the walkers. We had been lucky to have had this venue made available to us in lieu of the Belted Galloway. The owners hope to re-open this establishment on Tuesday following the mopping up and drying out process after its recent flooding, along with most of lower Newton Stewart, when the banks of the River Cree were overwhelmed after continuous rain earlier in the week.